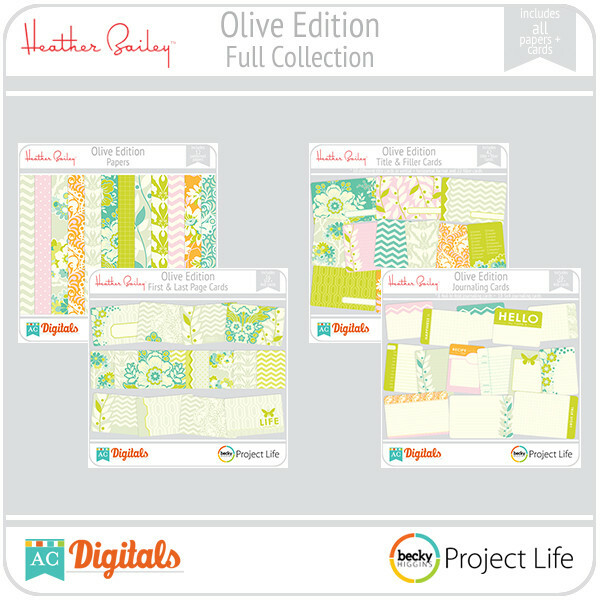 The Olive Edition of Project Life is on sale, today only, for 20% off. EDIT: Whoops, I guess this sale runs through the 18th. I don't know where I read it was only today. I have the physical Olive kit that I purchased about a month ago, and let me tell you, it is even more gorgeous in person than you can believe. The colors are breathtaking, it's so girly and feminine and beautiful and I am thrilled. I initially was planning to scrap my older photos with it, but I have decided to save it for now. I'm actually afraid to use it, it's so pretty :) At this time, I'm planning to wait and use this as my 2014 kit. It's so pretty that I want to make sure to use it for a project where I can use so many of the cards, and I think 2014 might be perfect. I did, however, just pick up the digital Olive kit (also on sale) today at ACDigitals.com. I am most definitely using the digital version of this kit for the hundreds of old photos my uncle has scanned that were my grandmother's. I want to make digital layouts (my first ever!) to upload into a photo book that I can print for all of my family members. If you were waiting to get the Olive kit, go grab it. It's AMAZING. I promise, you're going to love seeing it in person. And don't forget, the binder, dividers, and coordinating paper (which I'm planning to use in making cards) are also all on sale too. In other digital news, I've decided that I will scrap my own old photos as well as my wedding photos in digital format. I'm thinking I will use the Seafoam digital kit for my pictures, along with some of my own designs, and for the wedding photos...I haven't decided yet. It might be Olive (because really, if you haven't already gathered, I LOVE THIS FREAKIN' KIT), it might also be my own design. I'll decide soon and start sharing my layouts with you guys here on the blog!